It has felt like it's rained a lot in the last month. While that statement is somewhat true in that there have been a lot of days with measurable (0.01" or more) rainfall in Philadelphia, it's not a fully accurate picture that rainfall has been plentiful for all of the region....especially in the last couple of weeks. Over a 30 day period from June 5th to July 4th, Philadelphia has seen measurable rainfall on 14 days (almost half of the time). While rainfall has been above normal over those past 30 days (see map below), the 4.15" of rain it has received in that timeframe is just 0.75" above normal. While not really ark-busting by any stretch in Philadelphia itself, other areas have seen a good bit more rainfall in the last 30 days. 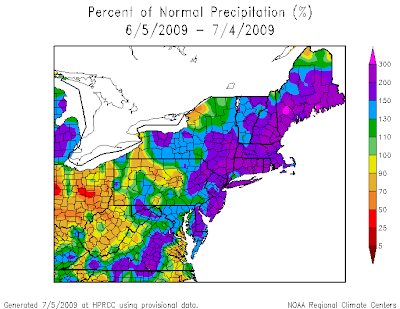 Coastal sections of New Jersey and the Lehigh Valley have seen nearly 200% or more of normal rainfall in the past 30 days, some of this compounded by heavy rainfall events that developed around the city but avoided the city and points southwest. Additionally, localized storm events in Montgomery County and Central Jersey have added significant rainfall just to our north and northeast but again, Philadelphia dodged the ark busting rains. When the last two weeks are taken into consideration, this rainfall hole tends to stand out more. 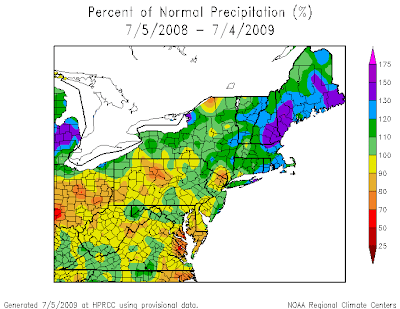 Philadelphia has only seen 0.37" of rain the last two weeks, less than 25% of normal precipitation in that stretch. Heavier rains have fallen to the north and northeast of Philadelphia, especially on June 30th (last Tuesday) and July 2nd (last Thursday). In both events, Philadelphia totaled 0.18" of rainfall combined while Souderton (nearly 3" Tuesday) and Allentown (over an inch on Thursday) were rained on more heavily. The dry area also extends south into Delaware and New Jersey. In early June, the malaise pattern of being stuck between the upper lows and the subtropical high was leading to chillier and more widespread rainfall. Rainfall was heavier and more widespread the first ten days of June, with the pattern breaking into a more summery but showery regime as scattered showers and storms have dotted the landscape due to the family of upper level lows passing near or just north of the Mid Atlantic but lacking a strong subtropical high to the south to set up a frontal boundary stalling through the region. With the frontal boundary in place, the pattern has been more conducive to hit or miss storms that have benefitted those to the north more than those to the south of Philadelphia. The good thing is that the early June rains have helped put some dent into a year plus dry spell. Some areas of North Jersey remain quite dry overall, with precipitation running less than 80% of normal across North Jersey and Southeast New York State. While areas south of Philadelphia are still relatively dry compared to average, May and June rainfall has helped close the gap somewhat from what was a dry end of winter and beginning of Spring.